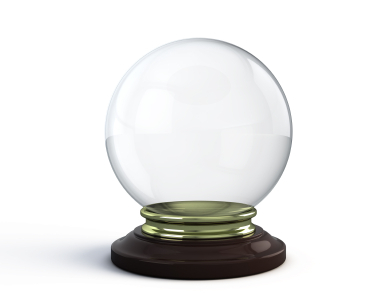 Is business planning worth the time and effort or is it like gazing into a crystal ball? I was talking to our bank manager yesterday and asked him how he was finding business in the current economic climate. He said that a lot had changed since the collapse of Lehman Brothers "in the autumn of 2008" that resulted in the credit crunch. He went on to say that they now have to determine theaffordability of any credit offered to new businesses and the banks now require detailed business plans, so that they can make an assessment. I said that when I first started Ayrmer Software ten years ago, I did not believe in business plans as I didn't have a crystal ball to hand, but now realise running a business without planning is suicide! Prior to the collapse of the banking system in 2008, banks would simply check your credit rating and their system would allow managers to offer a credit facility in line with the rating. In reality, this was a mistake as no realistic checks were made on the viability of a business idea and it's chances of success. Thankfully, when I started Ayrmer Software I had the initial capital needed to get the business off the ground, so never created a business plan. Several people had advised me that I should do a business plan, but I could not see the point, as in my view this was tantamount to attempting to guessing this weeks winning lottery balls! This meant that I started the business without any defined objectives and although I have survived to tell the tale I would take a very different approach now! Within the context of yesterdays conversation, we were talking about a formal business plan, which I would definitely do if starting a new venture today. However my apathy towards business planning covered a far wider remit than our discussion; I just could not see the value of any sort of formal planning, be it cash flow, sales or capacity planning. I saw this as a waste of time, I could not predict what might or might not happen, despite having previously worked within a project management environment (as a surveyor / estimator) where planning is a prerequisite. Planning allows you to define your goals, enabling you to anticipate potential issues. Furthermore, planning can help you measure your progress towards those goals allowing you to be proactive, should anything unanticipated happen. A few years ago we employed a business coach and he always stressed the importance of addressing the problems you know (or at least can anticipate), enabling you to focus on the curve balls you never see coming! We now have a number of tools in place the utilise information within the business that allows us to extract intelligence from the data held within the business. One of the most useful tools we have at our disposal is the cash flow forecasting that enables us to make informed decisions ahead of time. We also use capacity planning, for determining the resources required to complete projects on time as well as plan for future expansion. During the summer of 2008, we were able to see initial signs of the coming credit crunch / recession and knew that the next 6 months were going to be challenging. This was based on projections we had compiled using the tools I have already mentioned. We had already taken several initiatives that ensured the business was as lean as possible, but we could still see problems ahead. Armed with this information, we compiled a business plan that set out a road map for the following 12 - 18 months that enabled us to get funding from our bank, securing our cash position through 2009. Without this, we would have had serious problems, but because of planning, we were able to survive what was a relatively short term issue. In fact, by the end of 2009 we had managed to clear our overdraft and start building up our cash reserves again. It doesn't matter if you are embarking on a new venture or running an established business, planning will help you manage your business more effectively, enabling you to make informed decisions. Although, by my own admission, I used to see this as wasted time, experience has taught the contrary is true. As the old adage goes, fail to plan, plan to fail!